Polar bears (Ursus maritimus) in the northern Alaska region den in coastal areas and on offshore drifting ice. 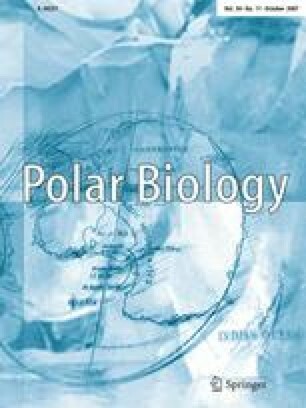 We evaluated changes in the distribution of polar bear maternal dens between 1985 and 2005, using satellite telemetry. We determined the distribution of maternal dens occupied by 89 satellite collared female polar bears between 137°W and 167°W longitude. The proportion of dens on pack ice declined from 62% in 1985–1994 to 37% in 1998–2004 (P = 0.044) and among pack ice dens fewer occurred in the western Beaufort Sea after 1998. We evaluated whether hunting, attraction to bowhead whale remains, or changes in sea ice could explain changes in den distribution. We concluded that denning distribution changed in response to reductions in stable old ice, increases in unconsolidated ice, and lengthening of the melt season. In consort, these changes have likely reduced the availability and quality of pack ice denning habitat. Further declines in sea ice availability are predicted. Therefore, we expect the proportion of polar bears denning in coastal areas will continue to increase, until such time as the autumn ice retreats far enough from shore that it precludes offshore pregnant females from reaching the Alaska coast in advance of denning. Principal funding for this study was provided by the US Geological Survey. Additional support was provided by BP Exploration Alaska, Inc., the Canadian Wildlife Service, Government of the Northwest Territories (Department of Resources, Wildlife, and Economic Development) Wildlife Service, the North Slope Borough, the Inuvialuit Game Council of Canada, ARCO Alaska, Inc., Conoco-Phillips, Inc., and the ExxonMobil Production Company, Inc. Data from polar bears radio-collared by the Canadian Wildlife Service and Government of the Northwest Territories (Department of Resources, Wildlife, and Economic Development) Wildlife Service in the Beaufort Sea of Canada, and by the USGS (G. Garner, deceased) in western Alaska and Russia, are included in this report. We thank D. Andriashek, S. Belikov, M. Branigan, A. E. Derocher, G. D. Durner, C. Gardner, C. V. Jay, N. Lunn, E. V. Regehr, S. Schliebe, K. S. Simac, and G. W. York for assistance in the field. Capture protocols were approved by the USGS Alaska Science Center Institutional Animal Care and Use Committee, and by the Marine Mammal Commission. Any use of trade, product, or company names in this publication is for descriptive purposes only and does not imply endorsement by the US Government.